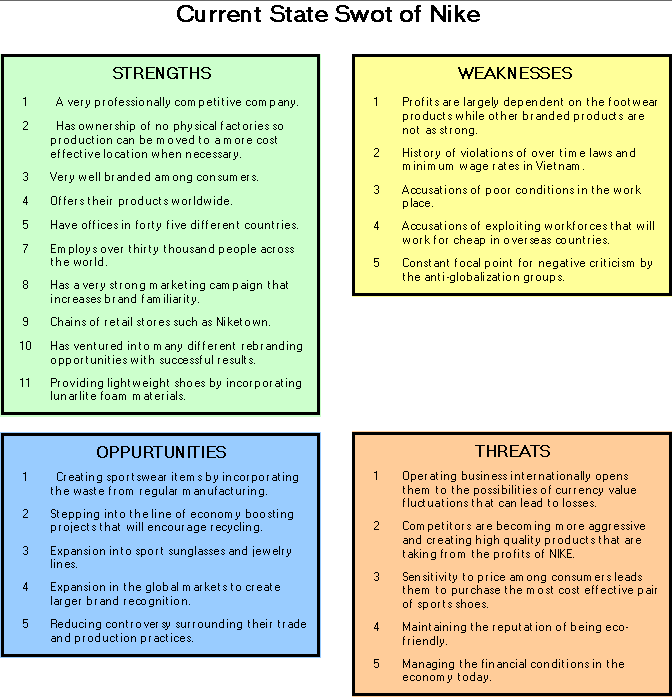 Lets create a SWOT Analysis Nike. A very professionally competitive company. Has ownership of no physical factories so production can be moved to a more cost effective location when necessary. Very well branded among consumers. Have offices in forty five different countries. Employs over thirty thousand people across the world. Has a very strong marketing campaign that increases brand familiarity. Chains of retail stores such as Niketown. Has ventured into many different rebranding opportunities with successful results. Providing lightweight shoes by incorporating lunarlite foam materials. Profits are largely dependent on the footwear products while other branded products are not as strong. History of violations of over time laws and minimum wage rates in Vietnam. Accusations of poor conditions in the work place. Accusations of exploiting workforces that will work for cheap in overseas countries. Constant focal point for negative criticism by the anti-globalization groups. Creating sportswear items by incorporating the waste from regular manufacturing. Stepping into the line of economy boosting projects that will encourage recycling. Product development that changes as the trends change. Expansion into sport sunglasses and jewelry lines. Expansion in the global markets to create larger brand recognition. Reducing controversy surrounding their trade and production practices. Operating business internationally opens them to the possibilities of currency value fluctuations that can lead to losses. Competitors are becoming more aggressive and creating high quality products that are taking from the profits of NIKE. Sensitivity to price among consumers leads them to purchase the most cost effective pair of sports shoes. Maintaining the reputation of being eco-friendly. Managing the financial conditions in the economy today.